As Mike reminded me today, with three weeks to go, I'm doing the "easy" walk of 50km rather than the full 100km for the Dixons Carphone Race to the Stones. Easy is not the word that would have sprung to mind if you'd seen my face when I reached Whitstable last week (check out our full report from the team's big walk). Phrases like "in a bad way" and "call a doctor" would be more appropriate. This is possibly the worst idea James has ever had. The fact that I only walked approximately 18km of the Crab and Winkle Way scared me. That's just a third of the total distance of 50km I'll be walking on the day, and thanks to my painful, bleeding feet – from not Vaselining in between my toes and wearing hiking boots when I didn't really need to – it took me six hours including a too-long lunch break. That's mainly because I lost the will to walk at a decent pace for the last hour and a half. I'm not gonna lie – I stopped to buy a Twister as it was pretty hot. And my walking companion Mike abandoned me once he knew how close we were to our pub destination. In my head it wasn't the day of the challenge, so I was within my rights to just trundle through the last section of roundabouts as we lost the trail, listening to political podcasts and feeling sorry for myself. Still, if I don't get faster, that doesn't really add up does it? I'm still going to do the Dixons Carphone Race to the Stones though, don't worry. First things first, I will be ditching my North Face boots in favour of my much lighter running trainers. These won't have the same ankle support but I can take a band to wear. I also checked the 10–12 hours box when I (finally) signed up for the race. I was always going to check the slowest box and to be honest I don't know if I'll get it done in 12 hours – what happens then? I'll have to check out the rules on how long you're allowed to stay out there, like when marathons have a cut-off time. The official website suggests this is 12 hours. Uh oh. Let's rewind a little. I've been wearing my Fitbit Alta HR tracker since the beginning of the challenge, but I'm not going to lie I haven't been wearing it every single day without fail. On the days I have worn it, I've genuinely found that I've been walking more. My problem is that at this stage 'walking more' isn't going to cut it, especially in flat London. 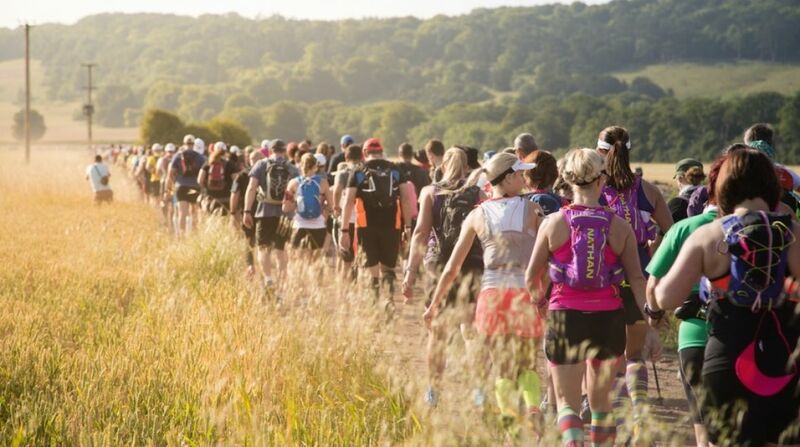 Incidentally we've just looked at the topography of the Dixons Carphone Race to the Stones – the boys were panicking about what they are calling a five-mile hill but the second 50km looks a little less intimidating in terms of horrible inclines. Still, it has been described as "unrelentlessly undulating" in a blog post. Nice alliteration but holy cow maybe my 30km in the Hebrides a few years back is the wrong comparison. Anyway, I've tracked a bunch of smaller walks in places like Epping Forest with the Fitbit Alta HR – 8km, 12km etc – and it's nice to see them as the starred days on the distance section of the app. It's also good to see my heart rate data in real time, getting up into the 130s in the aerobic zone. Unlike when I was running three times a week, though, my resting heart rate is still around 67 and isn't showing any signs of dropping gradually, a sign of improving fitness. I'm also still only 'fair' on Fitbit's cardio fitness score for women age 20–29. To be honest I was expecting closer to 'poor'. There's still time though. Is there? Yes. On the Whitstable walk day, the Fitbit Alta HR measured my total distance for the day as 26.8km, which included me getting home via a tube station full of Guns 'n' Roses fans who kept nearly stepping on my blistered feet, which were in flips flops by that point. That made me feel a bit better about the whole 50km thing. Not much though. Aside from the crucial shoe change, my plan is to definitely do a similar length of walk to that Crab and Winkle 18km on one of the two weekends before the Race to the Stones as well as three or four smaller walks somewhere hilly around London. I'll pay attention to time, too, which I haven't been doing at all. To walk 50km in the allotted 12 hours for day two, I'd have to aim to walk 18km in around four hours 20 minutes. That requires a marginal improvement in pace over my practice walk – albeit over three times the distance and not including breaks. I'm praying that with shoes that don't make my feet bleed and a bit more training I can last the distance – but divine intervention might be my only shot.